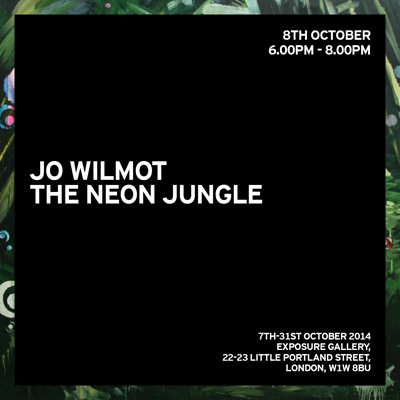 The Neon Jungle showcases Jo Wilmot's latest series of paintings. These works explore the idea of a rainforest, but one devoid of insects and oppressive humidity. The jungles depicted are not hot, dank places, but fantastical ones full of hallucinatory shapes and gaudy colours. Mixing up New Age iconography with the type of scenes usually reserved for tacky retro screensavers, the paintings are best summed up as J.G. Ballard meets Anaconda.